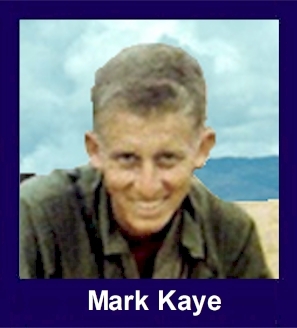 The 35th Infantry Regiment Association salutes our fallen brother, SP4 Mark Samuel Kaye, who died in the service of his country on February 9th, 1968 in Quang Nam Province, Vietnam. The cause of death was listed as Small Arms/AW. At the time of his death Mark was 23 years of age. He was from Studio City, California. Mark is honored on the Vietnam Veterans Memorial at Panel 38E, Line 53. The decorations earned by SP4 Mark Samuel Kaye include: the Combat Infantryman Badge, the Bronze Star, the Purple Heart, the National Defense Service Medal, the Vietnam Service Medal, the Vietnam Campaign Medal and the Vietnam Cross of Gallantry with Palm Unit Citation. Mark was the oldest of four children and took his responsibilities seriously. He was a shy person, but always stood up for what he believed. His devotion to his family and his country was strong and pure. His interests were music, mostly folk and early rock,theater and anything electronic, which he planned to really study on his return to civilian life. His family and friends still miss the sound of his hearty laugh and the strength of his support and sympathy when needed. Marks ashes are interred at Eden Memorial Park in Mission Hills, a suburb of Los Angeles, California. His fathers ashes were placed next to his in April, 2001. Mark is always in our hearts. "When they are very old"
I did not know I lied. I never knew my brother Mark as an individual. Mark was five years older than me. He was always in a different school, had different activities, interests and friends. Even though we both ended up gravitating to the theatre, by the time I got interested, he was away at college and then going into the army. As I entered college and felt like I could begin relating to him, he was serving in Vietnam. We corresponded, talking mostly about college life, gradually getting to know each other. Ill never know how our relationship would have developed and if we would have been friends. One event that stands out from my childhood also involves great distance between Mark and me. When he was in his mid-teens, he traveled to Israel and around the Mediterranean with our grandparents. When I woke up on the morning of my birthday that year, I found a package waiting for me from him. In it was an embroidered Israeli "peasant" blouse that fit me perfectly and made me feel very special. My brother Mark was ten years older than me and very protective of his youngest sibling. I have fond memories of our special relationship. He looked out for me and kept others from picking on me. He always had time for the questions of a curious younger sister. I remember when he was looking in the newspaper to buy his first car, a white Chevy Impala, I think. He stopped what he was doing to explain to me what all the abbreviations meant. There have been so many times I have wished he were here to give me advice. He came home for my birthday just before he went overseas. I woke up that morning and my mother told me to come to the kitchen, that she had a surprise for me. I was feeling lazy and selfish and so she sent Mark in to get me up! I was so happy to see him. I wish I had known then what a precious gift I was receiving. It would be the last time any of us would see him. Even after 35 years, visiting Marks KIA page on the website or writing about him brings tears to my eyes and pain to my heart. Valentines Day is especially difficult. That was the day the doorbell rang at 4am and an officer in uniform delivered the news my family dreaded. We do not celebrate that holiday anymore. I did not go to Marks funeral and it would be 22 years before I could really accept this loss and visit the site where his ashes are interred. Mark was a sweet and loving brother to me and I will always miss him.